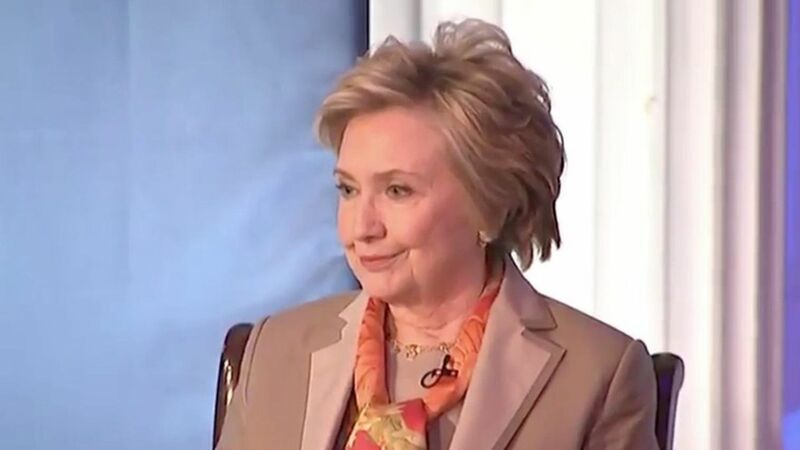 Hillary Clinton interviewed today at the Women for Women International Conference in New York City. In the span of a few minutes, she took "personal responsibility" for her 2016 loss, while also blaming her defeat on WikiLeaks and FBI Director Jim Comey. "I am writing a book, and it is a painful process reliving the campaign." "I take absolute personal responsibility. I was the candidate. I was the person on the ballot." "I was on the way to winning until a combination of Jim Comey's letter on October 28 and Russian WikiLeaks raised doubts in the minds of people who were inclined to vote for me but were scared off." Putin "certainly interfered...to hurt me." Electing the first female president "would have been a really big deal...There were important messages that could have sent." "I'm back to being...part of the resistance." On Trump's Syria strikes: "I don't know what kind of potentially back room deals were made with the Russians," but Clinton said she "did support" the strike, although not publicly. "I am going to publicly request that this administration not end our efforts making women's rights...central to American foreign policy..."
"One of the problems...is you ask people what was your last pay. If you're a woman and you've been underpaid before…it looks fair, but it's not. Because you've got built in inequity"
Artificial intelligence will be "upending the economy."